Chef Benjamin “BJ” Dennis is a Lowcountry original. 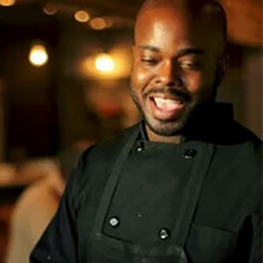 Born and raised in Charleston, SC, personal chef and caterer Benjamin “BJ” Dennis infuses the flavors and culture of the Lowcountry into his Gullah-Geechie cuisine, bringing a new taste to ever expanding culinary palate of the south. What differentiates Chef BJ’s food from his contemporaries in “southern” cooking is the homage he pays to the Gullah Geechee culture, brought to the Americas by West Africans, and disseminated along the West Indies and the American South. Dennis infuses the techniques of his ancestors, learned from four years of study in St. Thomas, as well as the lessons of his grandparents about eating from the land, to create fresh interpretations of local dishes focusing on in-season, locally sourced vegetables and seafood. Chef BJ has an associate’s degree in hospitality / tourism management and the culinary arts from the Culinary Institute of Charleston and has worked in a number of award winning southern dining establishments including Carolinas, Anson’s, Oak Steakhouse, Hank’s Seafood, and 82 Queen. His cuisine has been featured in local, national and international events including the BB&T Wine+Food Festival, Cook It Raw and Meatopia and his “pop-up” dinners, at local establishments such as Butcher & Bee, Elliottborough MiniBar and Proof, are sought after culinary adventures on the underground dinner circuit. When you taste BJ’s cooking, you can’t help but re-think your idea of soul food.